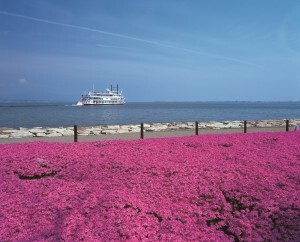 Otsu, Shiga is home to some of Japan’s most famous tourist spots, including Lake Biwa, the largest lake in Japan, and Mt. 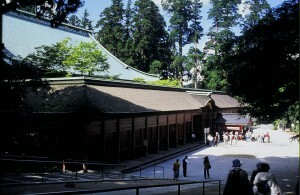 Hiei’s Enryaku-ji Temple, a UNESCO World Heritage Site. Conveniently located just nine minutes from Kyoto Station by train, many tourists from both Japan and around the world visit the city. With her skills developed in her career as a lawyer and her attention to detail as a woman, Mayor Naomi Koshi was only 36 years old when elected, making her Japan’s youngest female mayor ever. Taking advantage of Otsu’s nature and culture, she would like to make the city into a place where everyone can live to their fullest. I feel that Otsu’s greatest attraction is its scenery with water. Still, I didn’t really know how to become mayor. In the end, my work as a lawyer was very fulfilling, and at some point my dream of becoming mayor was pushed to the back of my mind. Then in 2008, I went to study in the U.S. at President Obama’s alma mater, at the time of his first presidential election. The students frequently spoke about “change,” with everyone actively participating in rallies, and the whole country seemingly filled with power from the idea of “let’s change the world.” I was moved by this power. I felt that I wanted to work to “change the world” as well, and reaffirmed that the place I could do so would be Otsu. I then returned to Otsu, and am now serving my second term as its mayor. Otsu has many tourist attractions, but Lake Biwa cannot be missed. In the last few years, the number of foreigners visiting Otsu has increased significantly. Visitors from Taiwan in particular have increased, and I am very happy to hear people who have come multiple times say, “I want to stay along Lake Biwa.” I think this is at least partly in thanks to going to Taiwan to promote Otsu along with representatives of hotels, inns, companies holding cruises on Lake Biwa, and priests from Enryaku-ji Temple on Mt. Hiei. 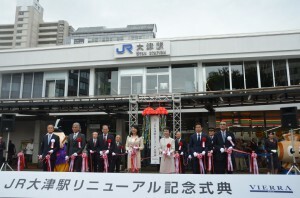 Last year, Otsu Station was renovated as well. The station building was the same age as me at 41, but has been reborn as a symbol of the city. The new tourist information center inside the station, Otsury, has staff to provide multilingual service, and there are rental bicycles available for visitors to enjoy the view along Lake Biwa, as well as sake brewery tours and soba-making lessons. We are making plans so that people of all ages, from Japan and abroad, will enjoy their time in Otsu. A capsule hotel attached directly to the train station with a café has also opened, providing fashionable, reasonably-priced accommodation. I would like to take inspiration from Geneva, Switzerland for developing Otsu. I have been to Geneva several times, and the street from the station to Lake Geneva is very similar to the street from Otsu Station to Lake Biwa. Lake Geneva is the town’s symbol, and it is very lively with open cafés and hotels surrounding it. The population is about the same as well, so I believe it could be a good reference for designing a town to take advantage of a lake. I would also like to promote the machiya, traditional Japanese buildings, that still remain in Otsu. Otsu was the closest shukuba or “post town” to Kyoto. 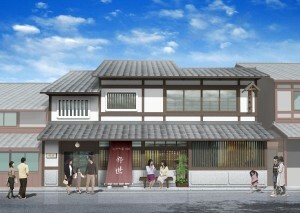 In April, a guesthouse using an old machiya will be opening. There are many historical machiya remaining within Otsu, but unfortunately more and more are becoming vacant. I think that by using those vacant machiya so that guests from overseas can stay in a traditional Japanese home, it will give them a chance to experience Japanese culture. Many people likely think of the 2011 Otsu bullying incident when they think of Otsu. Looking back, I have probably put more effort into dealing with bullying than anything else. This incident occurred in October 2011, and I became mayor in April 2012. It was then that I discovered that a proper follow-up investigation had not been carried out. What happened at the school, and what should be done to ensure it never happened again? Based on my experience as a lawyer, I established a third-party committee to carry out the investigation. Until then, there had been almost no investigations into the bullying problem by independent, outside experts. Without any, the truth could not come to light. Now, anti-bullying legislation has been passed, and investigations by third parties are done nationwide. With this, we have started a new initiative. Hiring lawyers and clinical psychologists, the city established a Bullying Prevention Office separate from the Board of Education. This provides a place aside from school for children to discuss their problems, which can suggest solutions different from what the school might, and has resulted in children that had no place to go speaking up. The Board of Education, which emphasizes listening to children instead of just dealing with bullying by making the bully apologize, has increased the number of teachers at elementary and junior high schools, and assigned a teacher to deal with bullying. This teacher has no homeroom class, and keeps an eye on the children during breaks as well as responding to cases of bullying. The number of female mayors and governors in Japan is still low, at only about 2% overall. Therefore, I would like to use the fact that I am a female mayor and create a society where women can choose freedom. One issue is the lack of space in daycares. When I first became mayor, there were approximately 150 children waiting for a spot, and I made it my goal to reduce that number to zero. Working on setting up daycares where women could leave their children while they work, I succeeded at this goal in three years. During that time, the total number of spots available increased by around 2,000, with new private-sector daycares being built. To reduce the number of children waiting for spots from 150 to zero, it was necessary to have enough infrastructure to support 10 times that amount, which indicates there was an extremely high level of latent demand: “I would like to work if daycare was available.” As mayor, first I worked on making the budget. Subsidies are necessary even when it is private-sector daycares being made, so I had to decide what could be eliminated to balance the budget. As a woman, I had seen first-hand the difficulties faced by my female friends and coworkers, and was able to determine what items should be prioritized to best match their needs. The total fertility rate for Otsu declined to as low as 1.31 for a time, but has recovered to 1.5. The number of women with children up to five years old who are working full-time has increased by 50%. Population decline and labor shortages are going to be major problems facing Japan in the future, and women are the key to stopping them. Therefore, I would like to continue my efforts to create an environment where women can work while raising children. Men’s attitudes towards work and raising children have also been changing. At City Hall, usually only one man at most would take parental leave in a year. So I established a system to encourage male employees to help in raising children by ensuring they could all take a short period of parental leave (up to eight days). They submit a plan for their parental leave, and preparations are made in advance to ensure work can be handled smoothly. As a result of this system, six male employees took long-term parental leave in FY 2015. I believe this is thanks to having created an atmosphere in which it is normal for men to take parental leave as well. On the subject of business, I would like to see more women start businesses. 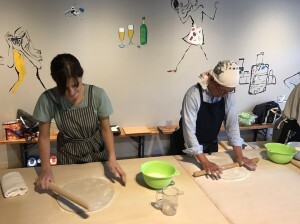 In fact, there are many women in Otsu who have quit working due to circumstances such as giving birth and raising children, but would like to start working again in fields related to their expertise or interests. However, many of them are faced with problems such as having lost their connections during their time away from work, or not knowing how to start a business even if they want to do so. 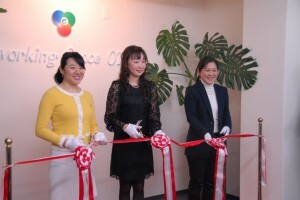 In response, the city opened Coworking Space Otsu in the fall last year. It is a shared office and rental space available for women who are planning to start or have started a business. A women’s business management school has also started, and there is a group of female business owners that supports women entrepreneurs. Together with women entrepreneurs and women interested in starting businesses, I would like to work on making Otsu into a mecca for women entrepreneurs.